Roughly a decade ago the military put an offer on the table for thousands of California National Guard soldiers: reenlist for six years and go fight in Iraq and Afghanistan in exchange for bonuses of $15,000 or more. 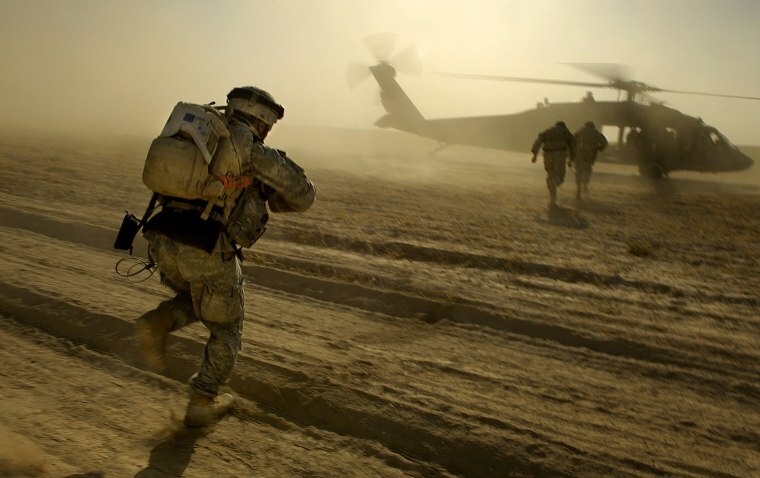 The soldiers who signed on the dotted line back in 2006 and 2007 upheld their end of the bargain, but now the Pentagon says the bonuses were improperly paid out and is demanding the money back. "Totally betrayed, that's how I feel," Susan Haley, who served 26 years in the Army and now owes the feds $20,500, told NBC News on Monday. "I didn't knowingly accept money I wasn't supposed to have. They wanted me to reenlist, and I was assured everything was fine." Haley, 47, has plenty of company. About 9,700 other California National Guard soldiers are also being asked by the military to return the bonuses. Haley, a former Army master sergeant from Los Angeles, said she got the first collection letter from the government in 2012 while she was at a Texas military hospital visiting her son, an Army medic whose leg had been blown off in Afghanistan. Haley, who also served in Afghanistan and now lives in Kempner, Texas, said she slit open the envelope, read the letter and nearly fell out of her chair. "It said I had improperly been given a signing bonus to reenlist and that I had to pay all the money back with interest or I would be in violation of federal law," Haley said. "I freaked out." Now, Haley said, she sends the Pentagon $650 a month. She said this is about a quarter of her family's income, and she's afraid they will lose their home. "I haven't paid yet this month," she said. "I don't have the money." Similar tales of woe from other hard-pressed California vets who got reenlistment bonuses have emerged since the Los Angeles Times broke the story over the weekend. The seeds of the scandal were planted back during President George W. Bush's administration when the Pentagon began offering big bonuses to get soldiers — many of whom had already served multiple combat tours — to reenlist. Nationwide, recruiters under pressure to find soldiers to fight two increasingly unpopular wars began doling out the biggest signing bonuses ever — and paying the money up front. Then, in 2010, federal investigators discovered that thousands of bonuses and student loan payments were approved for California Guard soldiers who either did not qualify for them or whose paperwork wasn't completed. Army Master Sgt. Toni Jaffe, the California National Guard's bonus and incentive manager, pleaded guilty in 2011 to filing $15.2 million in false claims and was sentenced to 30 months in federal prison. But instead of moving to forgive the botched bonuses, the California National Guard sent its auditors to collect from the soldiers. The military's move prompted House Majority Leader Kevin McCarthy, R-Calif., to call on the Defense Department to "waive these repayments." "It is disgraceful that the men and women who answered their country's call to duty following September 11 are now facing repayments of bonuses offered to them," McCarthy said in a statement. "Our military heroes should not shoulder the burden of military recruiters' faults from over a decade ago. They should not owe for what was promised during a difficult time in our country." McCarthy vowed that the "House will investigate these reports to ensure our soldiers are fully honored for their service." Both of the state's senators, Democrats Dianne Feinstein and Barbara Boxer, said in a letter to Defense Secretary Ashton Carter that the Guard members accepted the payments in good faith and had "paid a heavy price for their service — including severe injuries sustained after reenlisting." "This is unfair and appalling and we request that you halt the collection of these bonuses immediately," they wrote. Democratic presidential nominee Hillary Clinton said she, too, was "appalled," declaring in a statement: "We simply cannot allow this type of mistreatment of veterans, for any reason." Maj. Gen. Matthew Beevers, deputy commander of the California Guard, said the agency would be happy to "absolve these people of their debts." "We just can't do it," Beevers told the Los Angeles Times. "We'd be breaking the law." The California National Guard has helped about 1,200 Guard members file appeals to the Pentagon asking for forgiveness for some or all of their reenlistment bonuses, officials said. But there are thousands more who haven't filed any appeals — mostly likely because they're not aware they can — and are struggling to get out from under a mountain of military debt. Haley said that when she sought relief, she was told no. "They said I should have been keeping track of the money they were sending me," she said. "I was like, 'Really?'" A Pentagon spokesman said "the senior leadership of the department is looking very closely at this matter." "There is a formal review process in place through which affected service members can be relieved of responsibility to replay improperly awarded bonuses," Army Maj. Jamie Davis said in a statement. "In the meantime, the Department will work with the Army, the National Guard Bureau, the California Army National Guard and other relevant authorities to resolve these issues." In the meantime, Haley said she'll try and find a way to pay the feds back. "But I'll never get the six extra years I gave the Army back," she said.